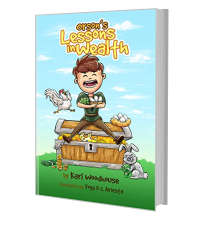 Orson’s Lessons in Wealth is a charming introduction to financial education for children. Orson is a boy who dreams of riches. He happily helps his mum in her little shop but, no matter how hard they work, there is never enough money to go around. They have no idea what it takes to become wealthy, and have no choice but to work hard day after day. A chance encounter at the docks, and an act of honesty with a golden coin, gives Orson the opportunity to learn the principles of wealth from the richest man in town. He is given a single day to discover the secrets of wealth building from his newfound friend and teacher. Will Orson’s dreams of plenty become a reality? Can he learn the secrets of abundance and make it home in time for dinner? Join Orson on a zany journey as he begins his financial education through song and dance, eggs and cabbages, and a host of memorable characters. 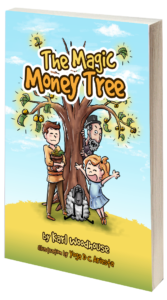 This delightfully illustrated story teaches children and adults alike the formula to prosperity that is not taught in most schools. Learning these important concepts at an early age can help prepare children for a lifetime of growing and giving. The Ballad of Egg Man Jeff is a poem that tells the tale of two of the characters in the main book, Jeff and Logan the Chicken. 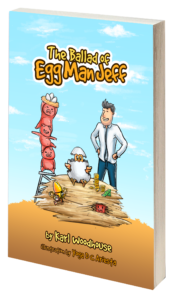 It is a cute tale of how they formed a business partnership and how they grew a humble farmyard enterprise in town he largest egg farm in town. Think you can use magic to get rich quick? Well think again. Aaron dreams of being rich, but he knows little about finance. When a passing stranger makes him an offer that sounds too good to be true, Aaron starts down a path that could leave him and his sister, Lily, destitute. Can Lily catch the con man and stop Aaron from squandering all their savings on a scam? Can Aaron learn from his mistakes and discover the real key to a wealthy future?